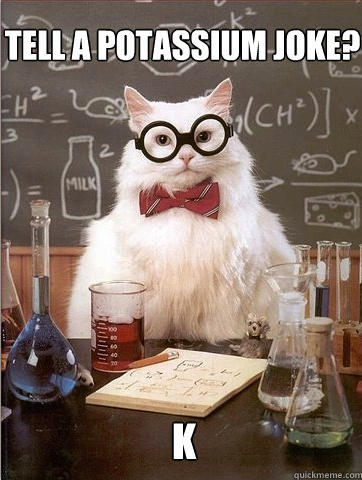 Two of my favorite things, together; science humor and cats! Quickmeme.com has a bunch of ’em collected for our perusing pleasure and there are generators everywhere. And this is a perfect excuse to post a great little animation of Tom Lehrer’s The Element Song. The man was brilliant and will have a digression of his own here one of these days soon. Antimatter pegs my geek meter pretty hard, especially when it’s in the real world. [A] research collaboration at CERN, Europe’s particle-physics lab near Geneva, Switzerland, has managed, 38 times, to confine single antihydrogen atoms in a magnetic trap for more than 170 milliseconds. The magnetic trap was an octopole electromagnet that created a balance point for an atom that “has a more subtle magnetic character that arises from the spins of its constituent particles”. That applies to regular ol’ hydrogen too. Granted, this isn’t very many atoms, and they aren’t the first to be created, but they lived the longest. Keep this up and we’ll be ready to start construction on the USS Enterprise 1701 in no time. One thing that stands out to me is that; Given that when antimatter and ‘normal’ matter meet they cancel each other out releasing energy, their sustained existence does seem to demonstrate that gravity is indeed a quantum force and without a physical component.